GrillGrates (TM) are an amazing recent invention and I recommend them for gas grills and many pellet smokers. They amplify heat, prevent flareups, make turning foods easier, produce great grill marks if you want them, keep small foods from committing suicide, kill hotspots, are easier to clean, flip over to make a fine griddle, allow wood placed right below the meat to smolder, and can be easily removed and moved from one grill to another. They may be the best thing to happen to gas grills and pellet smokers since salt and pepper, or at least since sear burners. Made by extruding aircraft grade aluminum into interlocking 5.25" wide rectangles, they are available in various lengths. Each section is a flat plate with five raised rails on which the food sits and they lie on top of your current grill's grates or they can be used to replace them. Each plate has large holes in it so hot air, smoke, and combustion gases can rise through them while most of the heat is trapped below and builds. As a result, the base can get very hot and the aluminum alloy distributes the heat evenly across the cooking surface eliminating hot spots. The bottom plate, 3/4" below the food, becomes the main heat source. This is a similar concept to the new expensive infrared cooking systems on the market. The heat also wraps around the edges creating convection when the lid is closed. According to the manufacturer, GrillGrates amplify the temp of gas grills up to 200°F and pellet grills up to 150°F. Charcoal is more variable depending on how many briquets you use and how they are distributed. The base of the grate blocks flareups and helps prevent burning. As a result, you get really crispy chicken skin without scorching. Juices drip into the valleys between the rails where they are vaporized and the vapors penetrate the meat, enhancing flavor. The holes in the base allow some juices through where they burn and smoke and combustion gases travel up through the holes to reach the food, adding more flavor. The solid bottom plate with its small holes spells the end of asparagus falling into the fire. You can throw wood chips, pellets, and sawdust into the valleys between the rails and then put food on top. The wood begins smoldering almost instantly and imparts a delicate wood smoke flavor even on fish and other quick cooking foods. They also work well on pellet smokers, which have an innate flaw of being primarily convection cookers. Pellet smokers can get up to 500 to 600°F air temp, but there is little radiant heat. Place GrillGrates on top of the factory grates and they can really even out the hot spots common to these cookers. Just don't go all the way to the edges so you don't mess with the airflow. The sturdy stainless steel custom designed spatula that comes with GrillGrates has fingers that slip between the rails and lift even the most delicate pieces of fish with ease. There are even special stainless steel tongs with fingers available as an option. GGs are easy to move from one grill to another. The manufacturer has several pre-cut sizes, but he will also custom cut them to fit your grill. Don't sweat it. Just get the closest size and just place them on top of your current grates. If you leave a gap between the GGs, you can easily set up a 2-zone cooking system. The air gap is a great way to keep one side of the grates from heating up. Notice that I have two grate panels on the right upside down. GrillGrates can be flipped upside down so you can put meat on a scorching hot flat metal griddle surface with holes that allow smoke through. Some people place all the grates right side up and they keep a spare section around just for griddling. 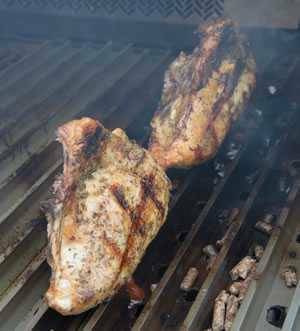 This section is sitting on top of a set of right-side-up GrillGrates, and I often throw sawdust or wood pellets on the right-side-up set so the smoke gets up into the burgers. Now that's what I'm talking 'bout. 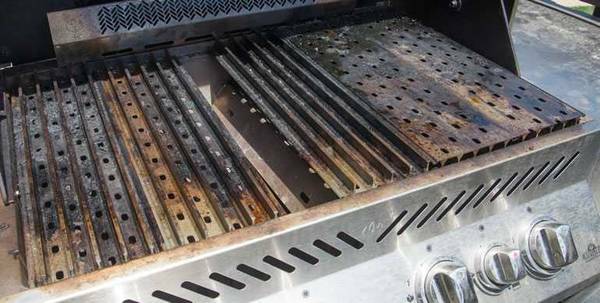 The surfaces of GrillGrates are easy to clean with a wire brush when hot. There is almost never grease buildup, just carbon in the valleys. It tends to build up there, reducing efficiency. A long bristle wire brush from the hardware store works well, but the standard wire brushes designed for grills do not. I've had good luck cleaning the valleys with a narrow paint scraper blade (and heavy glove) when they are hot. I tried superheating them and then hitting them with a hose, and, sure enough, most of the carbon popped right off, but one of the sections warped. After it cooled, I flipped it upside down on my deck and stood on it and it flattened right out! The hard anodized aircraft grade aluminum rail tops are flat and wide and make the most beautiful dark crunchy grill marks you've ever seen where they contact the food and cook it by conduction. They do wonders for thin foods getting brown flavors to the surface in a hurry before the centers overcook. Finally, let me allay any concerns you may have about aluminum. Here's a quote from Alzheimers.org's page on myths: "During the 1960s and 1970s, aluminum emerged as a possible suspect in Alzheimer's. This suspicion led to concern about exposure to aluminum through everyday sources such as pots and pans, beverage cans, antacids and antiperspirants. Since then, studies have failed to confirm any role for aluminum in causing Alzheimer's. Experts today focus on other areas of research, and few believe that everyday sources of aluminum pose any threat." Aluminum is everywhere. It is the third most abundant element on the planet. Studies always rate aluminum intake from cookware far down the list, behind dust, drinking water, antacids, antiperspirants, buffered aspirin, occupational sources, etc. And the healthy human body has the capacity for excreting what very small levels end up in the body. The manufacturer of GrillGrates claims that the anodizing process hardens the aluminum in GrillGrates making them harder than any steel. 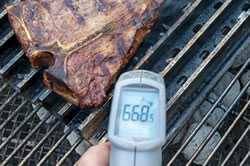 If you own a charcoal grill, toss them on top of the factory grates when you have thin or small foods but take them off when you want to get a dark sear on a steak so the meat is closer to the radiant heat. If you own a pellet smoker, I recommend these grates for improving the surface color of your foods. If you own a gas grill, I cannot recommend GrillGrates more enthusiastically as a replacement for your factory grates or on top of your factory grates for all your cooking. They simply make gas grills work better.